RetinaLink is honored to feature AAO, American Academy of Ophthalmology, President Dr. George A. Williams. Dr. Williams started his term on January 1, 2019. 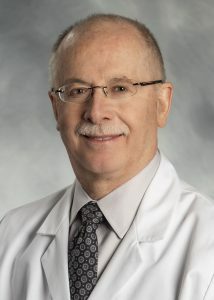 He is a partner with Associated Retinal Consultants and Chairman of the Department of Ophthalmology, Oakland University William Beaumont School of Medicine, Royal Oak, Michigan. Dr. Williams served as the AAO delegate to the RUC until last year and is the past Chair of the Board of OMIC. RetinaLink (RL): What are your initial impressions of the AAO in your first 100 days? George A. Williams, MD (GAW): I have had the privilege of working with the AAO, http://aao.org in a variety of positions over the years. I never cease to be amazed by the dedication and professionalism of the Academy staff and the thousands of Academy member volunteers who provide their time and talents to our mission of protecting sight and empowering lives. The AAO administrative infrastructure is the envy of the rest of medicine. My first 100 days as President have been busy. I have met with specialty and government leaders to address the many challenges that confront our mission. Issues such as step therapy, pre-authorization, rising drug costs and declining reimbursement are very real threats to our mission. We need to be certain that our advocacy efforts remain patient-centered. RL: How long is your term and what are your key initiatives? GAW: The Academy President’s term is one year. As President Elect, I served on the Board of Trustees and learned so much from my predecessor Keith Carter, MD, to prepare me for the role of President. My experience at the Academy has been centered upon health policy and that will remain a primary focus. However, I will continue to emphasize Dr. Carter’s seminal efforts to enhance minority representation in ophthalmology. It is imperative that our profession reflects the diversity of our patient population. The demographics of our profession are rapidly evolving. Currently, 25% of AAO members are women. In retina, that number is 17%. Given the fact that over 50% of medical students and ophthalmology residents today are women, those numbers will change and as they change so will the leadership of the Academy. In fact, it already has changed. Let me share some numbers with you. From 2007 to 2019, women have held 37% of Academy Trustee positions. From 2010 through 2020, 30% of Academy Presidents have been or will be women. Going forward, these numbers will only increase. RL: What is the biggest challenge in Retina? GAW: Over my career, I have witnessed the treatment of diseases such as macular hole, neovascular AMD and diabetic macular edema evolve to the point that we now expect to routinely make people better. This care is truly changing lives. The challenges lie in the delivery of care. Whether we continue to have the resources to provide care is a real concern. For the past decade or so, the retina community has been busy living in an “injection bubble”. It requires increased manpower and an efficient practice model to provide our patients the proper care. However, this “injection bubble” will burst as all bubbles do. Although this will be disruptive to retinal practices, it is likely that new technology will replace our injection-driven care and we will be better able to address current untreatable disease such as atrophic AMD. It is gratifying and truly remarkable how technology has changed in the last 20 years. The future appears even more promising. RL: What is the biggest challenge in Cataract? GAW: I would argue that modern cataract surgery is one of the most valuable surgical procedures in all of medicine. What other procedure has a better than 98% success rate, restores function to that of teenager or better, lasts a lifetime and costs less than $ 2,000? I have a great respect for my cataract colleagues. The challenge is to demonstrate the value of cataract surgery so it will be allocated the appropriate resources. We are beginning the transition to a “value-based world”. Ophthalmology should embrace this concept. Few aspects of health are more highly valued than vision. Our mission statement embraces this concept – protecting sight and empowering lives which allows people to live their lives the way they choose. RL: What does the future look like for Ophthalmic surgical devices and pharmaceuticals? GAW: As we previously discussed, we are living in an “injection bubble”. The immediate next big thing is whatever technology significantly diminishes the treatment burden to our patients and practices. Further down the road we need effective treatments for atrophic AMD and PVR. We now have proof of principle for gene therapy for retinal dystrophies and retinal prostheses. To date, stem cell therapy has been disappointing, but it holds great promise. Neuroprotection and optogenetics are potential game changers. I just hope I am around to see it. Instrumentation continues to improve incrementally; especially, imaging and visualization. The next big steps in surgery will integrate molecular treatments such as neuroprotection. RL: Please outline your impressions on Artificial Intelligence (AI). GAW: AI is already another game changer and we are only in the earliest stages. AI is predicated on big data and no specialty has more data than ophthalmology. The IRIS Registry* is the nation’s first comprehensive eye disease clinical registry and will provides indispensable insights and scientific advancements. Historically, the AAO has been an educational and advocacy organization. With IRIS, it is now also a research organization. As of January 1, 2019, IRIS has data from nearly 53 million patients, 223 million patient records and more than 18,000 physicians contracted from over 5,100 practices. As the largest clinical data registry within medicine, the Centers for Medicare and Medicaid Services (CMS) points to the Academy’s registry for other specialties to emulate. Some of our colleagues believe AI will diminish the role of physicians. I could not disagree more. On the contrary, AI allows physicians to focus on the most important aspect of care, the human aspect. Simply put, AI will make us all better doctors.